Our sports bar packages are located in either the 500 Club or Academy bars, in the North East Quadrant at Old Trafford. Both bars are lively and atmospheric with match seats offering a panoramic view of the pitch. 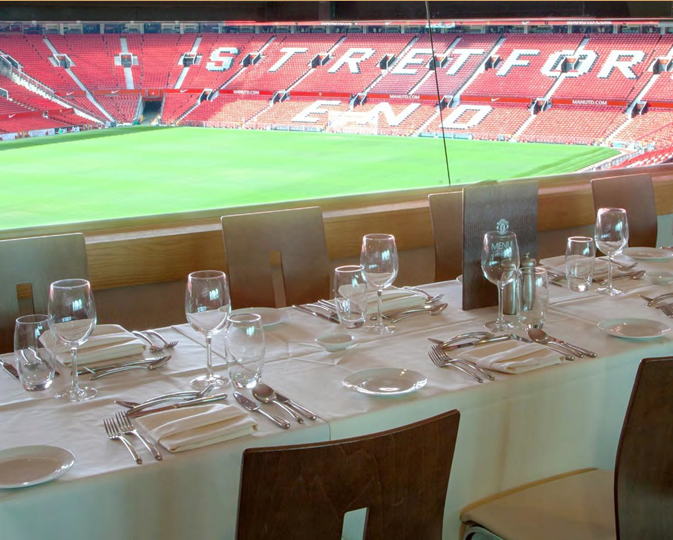 The Sports bars offer a cost effective, no fuss, and no formality way to enjoy the thrill of football at Old Trafford. You have the opportunity to purchase food and drink, so you can design your day to suit your own plans. Once you have arrived at Old Trafford make your way through the executive entrance, and be directed to your designated sports bar. You will be greeted by the hosting team who will welcome you to the bar for the day, and explain how things work. Poser tables are available to sit or stand at, and as you relax and take in the pre- match atmosphere you are able to purchase food and drink from the bar. *We charge a service fee of 10%.